Discussion in 'Introductions' started by Spartan 363, Apr 17, 2019. What's up everyone? New here but I've been lurking reading up on Meme's reviews that have been very helpful. As my name suggest, big fan of Halo but I'm also a big fan of Final Fantasy having played them since the 90's. I'm a free to play player and have assembled a pretty decent physical attack based team and now I'm slowly working my way towards building up my magic based A team. Still have a long ways to go compared to some of the teams I've seen here and such, lol. Diaskeaus, Masvroh, Jatabo and 7 others like this. 3. Welcome to the F2P gang! Magic DPS are rarer, but you’ll get there. Good luck, and welcome to the forum! Yeah, I was super lucky this morning in getting HS Ultima with the daily half off and then decided to use tickets I'm hoarding for Akstar but luckily, only had to use about 30 tickets (27 regular and 3 4* tickets). I also pulled two off banner 5* units that allowed me to get two 50% Trust Moogles from both Fohlen and Eiko. So I used those to get HS Ultima's TMR. 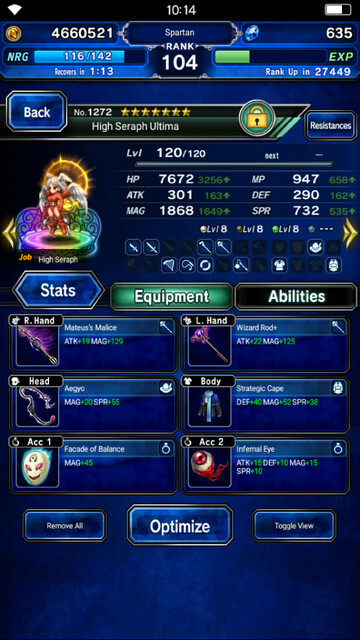 This is what I have equipped on her for now and I got almost enough Trust Moogle's for another TMR that may be one of the units that have 40% MAG TMR. For my MAG based A Team, I'll use these units once I can get better equipment because until recently, I was only focused on ATK based equipment. For now, it's not too great and will need better equipment until I can throw them to the wolves. Fenix808, Masvroh, Regalia and 2 others like this. You could make a magic DPS team with just Emperor or just HSUltima and a friend HSUltima, so no problem there. Welcome to the forum! Thanks for coming out of lurking to join us! Fenix808, Seven and Spartan 363 like this. Sure thing, had that in mind for now, just need to get dupe Emperor's TMR for himself and dupe HS Ultima's TMR for Emperor. Yeah, she does pretty good damage but still learning how to properly chain MAG abilities since I've been mostly an ATK based player for about two years now. I figured those two on my MAG A Team were good enough when properly equipped. I too lol'ed at the ADV II but that's what I have on her for now until I get the two 1% and one 5% Trust Moogles by the weekend to get Reis TMR that has 40% MAG stat. I also have both a 6* Rinoa and Trance Terra that I hope to get another soon to make them 7* and to shuffle them around along with getting enough UoC tickets for another Auron because he's my only good breaker despite being a 6* and has about 1500 ATK which isn't too shabby for a 6*. Welcome to your new home! I hope you enjoy your stay! 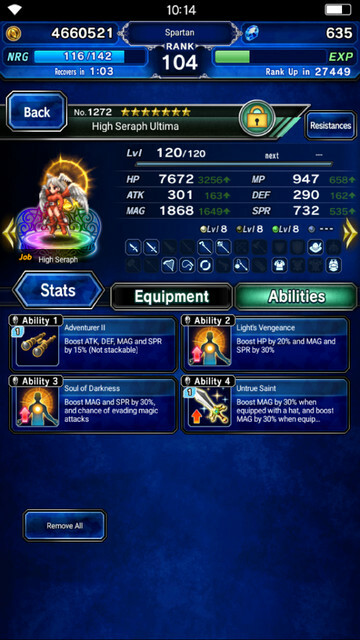 Even at 6*, Auron does a really good job as breaker. 60% on demand is nothing to sneeze at, and is good for clearing a lot of content. I was stuck with pre-enhancement Basch's 50%'s for the longest time, and he took me right up to the Armor of Oppression. Could possibly have taken me further, but I got my 7* 2B at that point and made the switch. Welcome to the Brood. Feel free to invite if you need someone. Not as high level as many here, but I am active and always willing to change out a unit here and there to help! Spartan 363 and Regalia like this. Yeah, what he said, lol. I try to keep a few friend slots open for forum members. Spartan 363, Seven and Antioch like this. Greetings friend, there, you have been followed by the ultimate follower. Now, RUN WHILE YOU STILL CAN. OR YOU SHALL SUFFER THE FATE OF ALL OF WHO LURK HERE, THE WRATH OF SODIUM AND CHLORINE. IONICALLY BONDED BY AN ATTRACTING FORCE. It just means you'll get salty somehow, so anyways, welcome to the forum and I hope you enjoy your stay. Spartan 363, TheKillingJoke and Seven like this. I take your sanity as long as you are a member. Can't guarantee that you get it back in good shape. Spartan 363 and Seven like this. Spartan 363, Seven and TheKillingJoke like this. Spartan 363, Seven and Frosty Toast like this. Spartan 363 and TheKillingJoke like this. Damn, you already can reach high offensive stats on rank 104.. I could not do it until rank 130.